After its extensive restoration this historic Castle is still used as a private home but is available on a self catering basis when not occupied by the current owner. The Castle is a sprawling baronial mansion which has well over one hundred rooms, there are twelve staircases, and five of them stone spirals. The castle has the largest wine cellar in Ireland with a capacity for 55,000 bottles. You can explore this at your leisure during your stay. 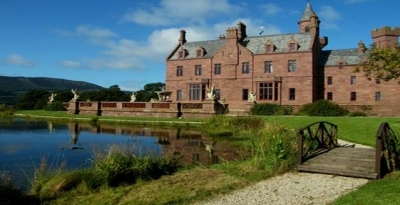 Set in 15 acres of beautiful private parkland, surrounded by thousands of acres of unspoiled Irish countryside. Located in the beautiful Ballyhoura Mountains, the castle is halfway between Limerick and Cork city. Both Shannon and Cork airports are less than an hour's drive away. The cost for renting this fine castle includes heating and electricity. The castle has five superior bedrooms and three deluxe, the superior rooms boasts unique hand carved 4 poster beds, which were commissioned for the castle during its recent restoration all beds are dressed in Egyptian cotton sheets with exclusively made throws. All the ensuite bathrooms are extremely spacious; they host unique large bath tubs; power showers and have luxurious toiletries, robes and towels to make your trip truly memorable. The Castle can sleep up to 16 people in eight ensuite rooms, but more can be accommodated. On arrival to the castle you will be welcomed by the butler in the Clondfoy Hall with its large open fire and stain glass windows depicting St Patrick's life. Awaiting you under the large crystal chandeliers in the Ballroom and joining Drawing room a champagne reception. Partake of your meals in the candlelit Dining room with its antique oak dining table that seats twenty two, or tickle the ivories of the baby grand. Relax by the fire in the Library reading a book from the extensive selection or withdraw to the Billiards room. Why not de-stress with a soak in a luxurious scented bath tub, and relax in one of our unique 6ft four poster beds.